The Actual Width of Tires? Decades ago, some tire makers cheated when stating tire widths. Why? To make their tires appear lighter than they really were. By selling a 25 mm tire as a 28 mm, they made the tire seem lighter than the competition’s tires, which actually were 3 mm wider. 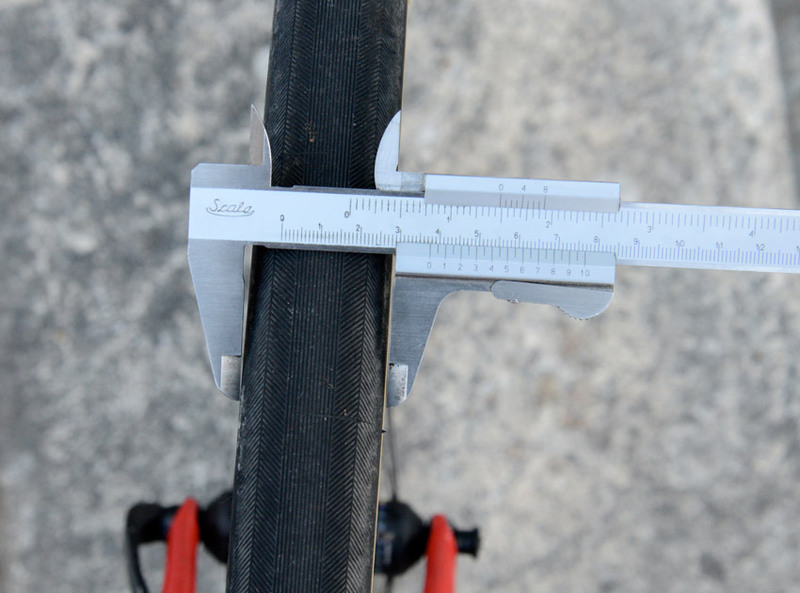 It can be difficult to accurately measure the width of a supple tire. The casing of supple tires stretches for a few weeks or even months after they have been installed. Tire width depends on tire pressure and rim width. That means the actual width can be a little narrower or wider than the nominal width. I recently installed a set of Compass Barlow Pass Extralight 700C x 38 mm tires on a Bicycle Quarterly test bike. How wide are they really? When you measure metal with calipers, you squeeze the calipers until they won’t go any further, and then read your measurement. If you compress the calipers on a rubber tire, the tire will deflect. In this case, I measured 34 mm. But that isn’t the actual width of the tire: If you tried to fit the tire into a frame with just enough clearance for 34 mm tires, it would rub. 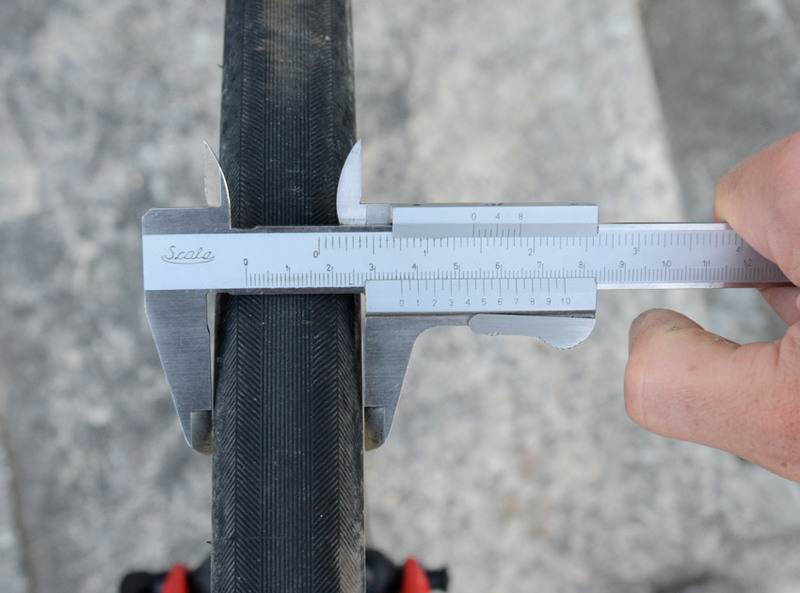 Here is how you measure tire width: Open up your calipers in 0.5 mm increments. Check whether there is “play” between the caliper jaws and the tire. In the photo above, I am already at 35.5 mm, and the calipers still fit snugly on the tire. At 36.5 mm, I am finally getting some wiggle. This means that the tire is just over 36 mm wide. That is the width when it’s new. Two weeks later, I measured the tire again. It has stretched to 36.5 mm. I was surprised that it was still so narrow, until I checked the tire pressure. I had let the pressure drop to about 30 psi. How wide would the tire be at its maximum pressure? I inflated the tire to 75 psi, and lo and behold, it now measured 37.5 mm. It probably will stretch a little more, and achieve its full 38 mm width before long. Of course, I wouldn’t ride it at that pressure (unless I put it on a tandem), so at the pressures I usually ride, the tire will be a tad narrower than its nominal width. Should I inflate my tires to a higher pressure to make them wider? No, that doesn’t make sense. Your tire’s comfort and performance is determined by the tire width at the contact patch, which gets larger at lower pressure. Putting more air than necessary into the tire defeats the purpose, even if it makes the tire wider where it does not touch the ground. For narrower tires, rim width also plays a role. The Compass Stampede Pass tires measure about 31 mm on a 20 mm-wide rim, like a Mavic MA-2, but 33 mm wide on a 23 mm-wide rim, like a Grand Bois rim. For wider tires, this is less of a factor, since all the rims we use are narrow when compared to the wide tire. In any case, our testing has shown that the material and construction of the casing are more important for comfort and speed than a millimeter or two in width. When you put a set of supple Compass tires on your bike, you’ll notice a huge difference in how the bike feels and performs. And when you buy your next bike, make sure to spec a frame that provides ample tire width. On my own bikes, I am not too concerned whether the tires measure 39 or 41.5 mm. Either is ample for most of the riding I do. Further reading: How Wide a Tire Can I Run? 26 Responses to The Actual Width of Tires? First, the limiting factor on my frame isn’t tire width, it is clearance to the brake bridge. Is there a way to predict tire height, or will I just have to put tires on and see if they fit? Second, I suspect my brakes were designed to open up enough for 25 mm tires. Other than deflating and reinflating the tires, is there an easy way to get wider tires between the brake pads? The tire height is harder to measure. Our tires are very round, so they are less high than many other tires in the same width. Regarding wheel removal with brakes that don’t open wide enough, deflating the tire is the only option. You could use brake levers that also have a quick release – in addition to the QR on the brake itself – so that the brakes open wider. There’s a trick you’re missing. Instead of setting the brake cable adjusting barrel the way local bike shops do, screwed all the way down so as to give maximum room for adding tension to compensate for brake pad wear, set the cable with the adjuster screwed all the way out. This way, when you screw the barrel down and relax tension, the brakes can open up wider. Not as convenient as having a QR lever on the brake, but it works with all brake levers and you already own it. In my experience, a wider rim tends to lower the height of a tire, all other things being equal. For getting the wheels in and out, there are three options I can think of. This assumes that your issue is cable tension (and not that the brake arms themselves can’t open wide enough even with no cable present). 1. Barrel adjusters. Either on the brake caliper, or in-line. 2. Shimano makes a specific in-line Q/R, the SM-CB90. 3. For the rear brake, if you do not have full housing runs, it is sometimes possible to open your brake QR, and then have enough slack to pop a section of housing out of the stop, which will then give you tons of cable slack. The width of the rim can change the aspect ratio of a tire, i.e. a wide rim will decrease the aspect ratio compared to the same tire mounted on a narrow rim. As aspect ratio is decreased the width of the tire increases and the height of the tire from rim to the tread decreases. 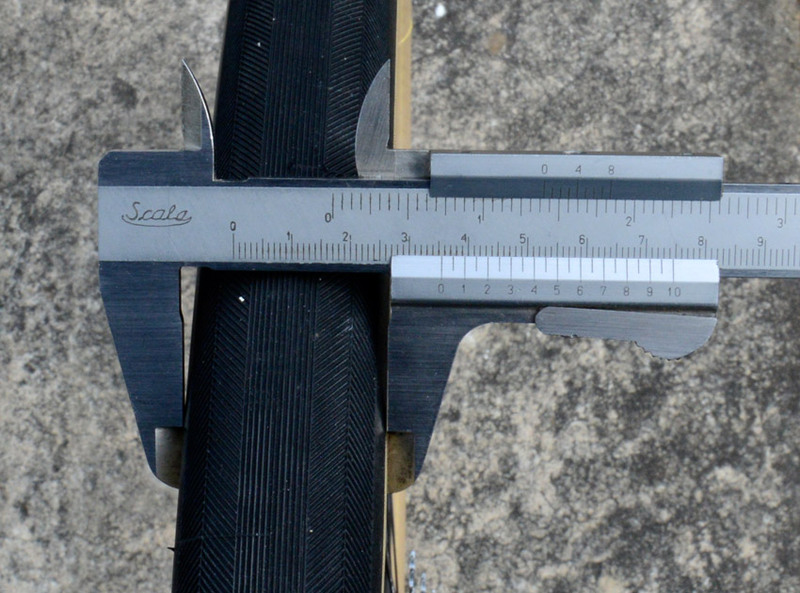 So which rim width do your stated tire widths refer to? Thanks. We measure our tires on 21 mm wide rims (outside width). Is there any reason you prefer using the outside width of the rim? Seems like the inner rim width would be a more universal rim vs rim comparison. Panaracer Paselas used to be pretty famous for being much narrower than stated width. I don’t think I’ve ever encountered a tire that was wider than the marked width, even on a wide rim (and rim width matters!). I just measured a bike with older 700 x 35 Paselas on 23 mm rims. Just to make it more interesting, the tires are also marked 37-622! Actual width at max, pressure? 30.8 mm. That is interesting. We used a set of 37-622 Paselas as our reference tires in our first tire tests. They measured 35 mm. Did you measure yours iteratively as described in the post? I re-checked it a bit more carefully, using your method, plus it has now been at 75 psi for a few hours (normally I don’t run them at that pressure). I’m getting 31.1 mm width on the rear, and about 31.2 mm on the front one. I’ll check again after a day or two, but I don’t expect them to grow much, if any. These are quite old tires, I suspect, fwiw, as they were on the bike when I purchased it, and that was several years ago. The rims are vintage Super Champion #58. Those are probably the ancient model with the center rib tread. The ones we used are the newer model with a round profile. 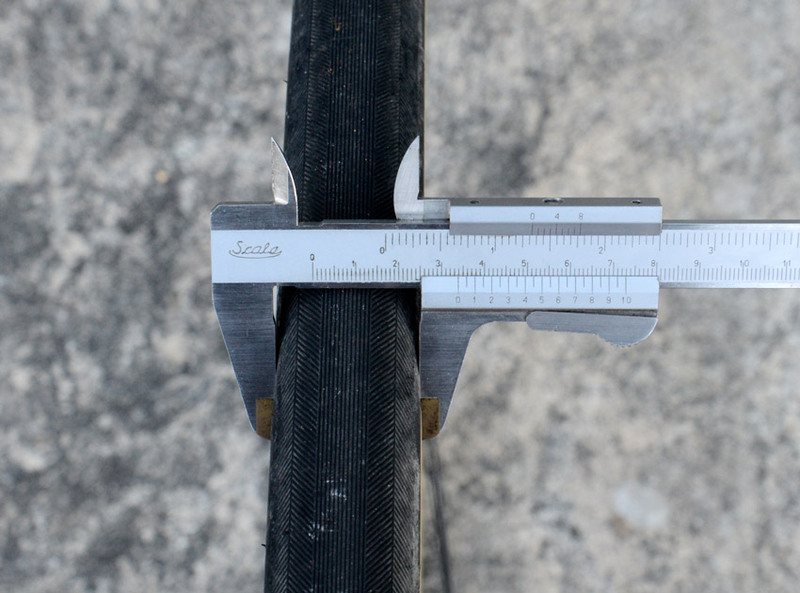 “I don’t think I’ve ever encountered a tire that was wider than the marked width…” Michelin Pro Race 2 700x25C measure 27mm, and the Challenge Parigi Roubaix, marked 27mm, is almost 29mm on most rims. Feel free to add your own measurements to it or fill in missing info. It’s not nearly as up-to-date as it could be, but still useful. It’s interesting that they list the Grand Bois Cypres several times, with widths of 29.5 to 31.99 mm. This shows how difficult it is to get good measurements on tires. 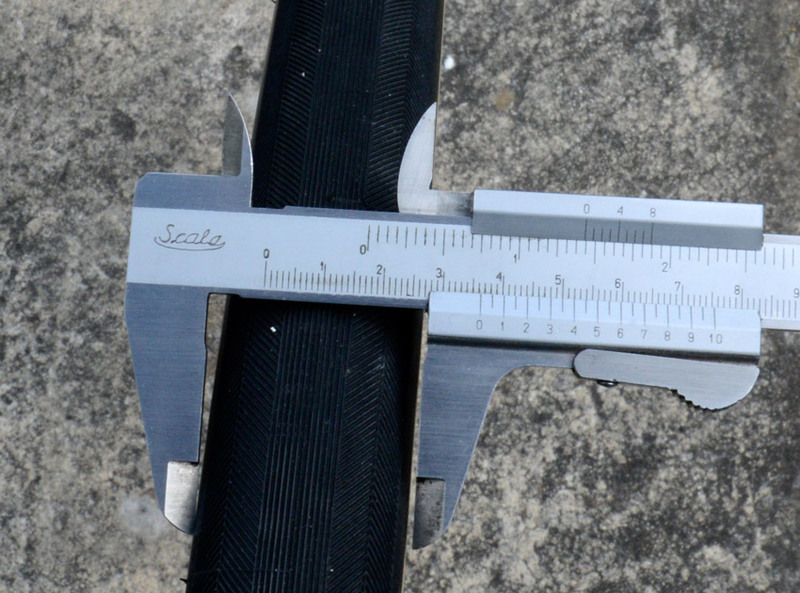 Of course, rubber being floppy, it makes no sense to try and measure tire width with that much accuracy. I figure that 0.5 mm is about the smallest increment that makes sense and can be measured with reasonable repeatability. The variability is interesting. There’s also much missing information about pressures, how old/worn the tires are, and what the rim internal width is, which matters more than the external width. How long does a tire mold last? I suppose it’s possible that mold degradation could contribute to final tire size? Interesting. Note that, with the exception of Challenge tires, almost all others are at or slightly below their marked width. That matches my experiences, and makes sense from a product useability standpoint. Jan, using a 21 mm ‘standard’ rim makes sense, as an awful lot of current and vintage road rims are in the 19-23 mm width range. now has a column for inner width. outer width is only relevant for aerodynamics, and even then . . . I finally mounted my Barlow pass tires, and the ride just as smoothly as they were advertised. Besides maybe riding a bike thats 5 pounds lighter up a hill, I can’t think of anything that makes as big a difference as these tires. They are great. That being said, going from 45mm tires to tires that measure 36 is also a big difference. That 35mm range seems like a tweener. By looks and by feel they are very different from the 42mm Babyshoe/ Hetre tires. I assume thats why you offer both 38 and 42mm tires on the 650B line. I’m sure there are reasons to not have a truly wide, supple, and fast 700c tire, but for all the Rivendells, Surlys, old TREKs (etc), the wait continues. The Barlow pass tires are obviously fast, but the comfort, security (freedom from flats), and floating-like feeling of “demi-balloon” tires is a very different experience. wider = lower tire pressure = awesome! 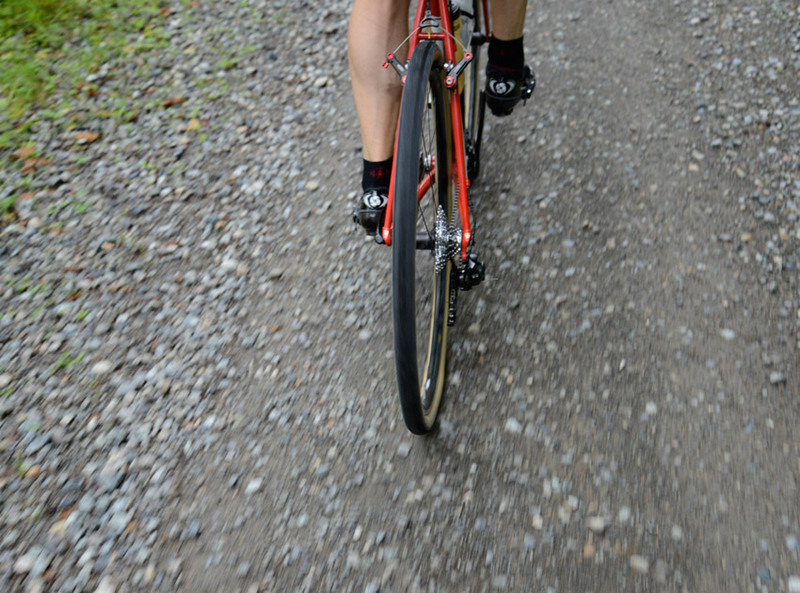 The main reason to offer a 38 and a 42 mm tire in 650B is that many bikes don’t fit a 42. In 700C, that is even more the case, where most cyclocross bikes don’t fit a 42 mm tire, either. If we sell enough of the Barlow Pass 700 x 38 mm, we’ll consider offering a 42. In that case I’ll buy up all the Barlows right now! And all the “Donner Pass” 42mm tires when they arrive in hopes of a 50mm wide n fast tire!